In fact, he taught at Boston University for nearly four decades, and with this book, Ariel Burger—devoted protégé, apprentice, and friend—takes us into the sacred space of Wiesel’s classroom. There, Wiesel challenged his students to explore moral complexity and to resist the dangerous lure of absolutes. In bringing together never-before-recounted moments between Wiesel and his students, Witness serves as a moral education in and of itself—a primer on educating against indifference, on the urgency of memory and individual responsibility, and on the role of literature, music, and art in making the world a more compassionate place. Burger first met Wiesel at age fifteen; he became his student in his twenties, and his teaching assistant in his thirties. In this profoundly thought-provoking and inspiring book, Burger gives us a front-row seat to Wiesel’s remarkable exchanges in and out of the classroom, and chronicles the intimate conversations between these two men over the decades as Burger sought counsel on matters of intellect, spirituality, and faith, while navigating his own personal journey from boyhood to manhood, from student and assistant, to rabbi and, in time, teacher. “Listening to a witness makes you a witness,” said Wiesel. Ariel Burger’s book is an invitation to every reader to become Wiesel’s student, and witness. ARIEL BURGER is a writer, artist, teacher, and rabbi whose work combines spirituality, creativity, and strategies for social change. A lifelong student of Elie Wiesel, he spent years studying the great wisdom traditions, and now applies those teachings to urgent contemporary questions. When Ariel’s not learning or teaching, he is creating music, art, and poetry. He lives outside of Boston with his family. "A beautiful, deeply moving memoir...[a] complex, multilayered book...Burger’s honest depiction of doubt — both Wiesel’s and his own — is a great strength of this memoir, and its constant concern with the limited power of the individual is timeless. While Wiesel privately worried about the power of one person’s words in the face of hatred, this book of questions and memories makes a case for the power of teaching, and for words as perhaps the ultimate teachers of how to live." "Burger transports the reader to those salons of learning on the Charles River, where Wiesel's students over the years ranged from the granddaughter of a Nazi SS officer to a Korean minister in training...Unlike the best-selling 'Tuesdays with Morrie' – which highlighted author Mitch Albom's relationship with another Boston-area professor – Burger's book has a protagonist who was already world-famous. Witness does have a Wednesdays-with-Wiesel feel. Burger intersperses bits of his own life and background as he shares an album's worth of snapshots from Wiesel's time at BU. Burger's tone and execution are exactly what his title promises – and in keeping with the way Wiesel lived his life." —USA Today, "New book shares Elie Wiesel's powerful classroom lessons from the Holocaust"
"Any reader of Witness can now become another student of Wiesel’s, and another witness, as it is clear that Ariel Burger has become a teacher with its publication." "Inspiring and substantive...Amid all the Wiesel wisdom, Burger interweaves bits of his own autobiography, including his childhood and an account of the years he spent in Israel before his doctoral studies. Neither irrelevant nor self-indulgent, these strolls into memoir help establish Burger as a trustworthy and likable guide, a fellow learner who has invited us to sit next to him as we absorb hard-won knowledge about the shape of a good life from a sage. An insightful and winsome love letter—and, for newcomers to Wiesel, a good introduction." 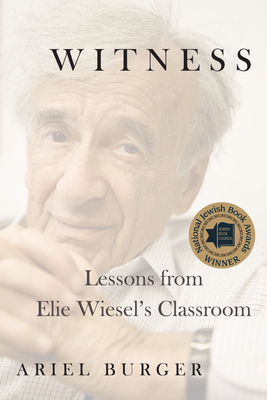 "Current, former, and future educators will love the glimpses into Wiesel’s practices, such as the way he guided discussions on difficult but important topics—the tensions between faith and doubt, the relationship between rebellion and madness, and effective strategies for activism—and the personal attention he lavished on students...Burger’s love for Wiesel, both professional and personal, shines through, and the reader will walk away with renewed admiration for this remarkable scholar, writer, survivor, and teacher." "A student of Wiesel's, Burger recounts how Wiesel lit his mind on fire. He later became Wiesel's teaching assistant and colleague, and this book parts the curtain on Wiesel's stimulating and lively classes, which challenged students...Readers will find their own preconceptions called into question, as though they were in class, too." "In this thought-provoking book, Burger brings readers into Elie Wiesel’s classroom, where the art of listening and storytelling conspired to keep memory alive. In the vein of Tuesdays with Morrie, Burger shows that Wiesel, a Holocaust survivor and Nobel Peace Prize recipient, was not only as an extraordinary human being, but a master teacher." "When Elie Wiesel spoke the world listened. His voice and words were crucial in the worldwide fight against terror, persecution, and genocide. Ariel Burger gives readers a unique chance to hear Wiesel’s private voice, the voice of the caring and loving teacher. Burger takes us behind the scenes and we are better for it." "Burger recounts his inspiring relationship with Wiesel and the generous lessons he learned from him in this hopeful book." —BookPage, "Most anticipated fall nonfiction"
"In his new book, Witness, Burger vividly situates the reader inside Wiesel’s classroom. He shares details of the thought-provoking lectures as well as the heartfelt questions with which Wiesel challenged his students." "Offers enduring insights for today’s struggles...The book focuses on one of the central principles of Wiesel’s life and teaching: that great books, great philosophers, great literature—the big, enduring questions—can help us with the urgencies of day-to-day living." "For health communicators, pharma executives, scientists, physicians, providers, and payers interested in learning how to calibrate their own ethical compass, a book expected to be released in November, Witness: Lessons from Elie Wiesel's Classroom, is one to place at the top of our reading lists. Witness is a moral education – 'a primer on educating against indifference, on the urgency of memory and individual responsibility'...It is not a business book; better, it is a guide for ethical behavior and should instill courage in the reader to make tough, necessary decisions." "This book was exactly what I was seeking with Elie Wiesel’s memoirs: it summarises Wiesel’s concise teachings on keeping history alive through morality and vulnerability. You’re guaranteed to leave Ariel Burger’s Witness with a changed perspective."